We are a leader in offering a best quality of Namkeen Making Machine to our clients. 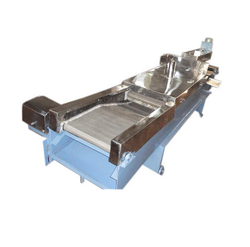 This Namkeen Making Machine is made by superior quality raw material. This is available in different sizes and shapes. This is more durable and reliable in nature. Customers can be easily purchase from the market at attractive prices. All types of fryers available. Reckoned in the industry as a prominent organization, we are offering Namkeen Making Machine. After production, these machines are checked on various parameters by our team of quality controllers to ensure defect-free range. Used in namkeen industries to make the namkeen in various shapes and design. - Other capacities and in stainless steel body can be made on demand. Our company is one of the leading supplier of Namkeen Making Machines.